Soutzoukakia are a -special occasion -food, something served when you have company or for a Sunday dinner. One of the reasons is that, well, this is meat and meat was not served every day, the second reason is that these meatballs are exceptional. These are not just any old meatballs: Meatballs full of spice, drenched in thick tomato sauce satisfy that need, when you really want something rich. However, I’ll eat them occasionally at a restaurant because they are a bit too “rich”. You see, the traditional way is to make them is by frying them, this preparation along with all the spices make them very tasty, but sometimes a bit difficult to digest. But there is a solution: Baking them. By avoiding the frying you have a slightly lighter dish but you still use all the spices. There is no difference in flavor. You can adjust the spices more or less to your taste, but this Asia Minor influenced dish is meant to be spicy. This particular recipe is an altered version by my mom from the traditional Greek cookbook of Hrisa Paradisi. In her book she includes the regular recipe (fried) but also a baked one. My mom and I slightly adjusted it (Paradisi recommends using butter-my mom used only olive oil). The tomato sauce is simple, and when heated along with the olive oil you have an increased absorption of lycopene (a protective antioxidant) but also increased absorption of iron from the meat. Usually this dish is accompanied with rice and a seasonal salad. 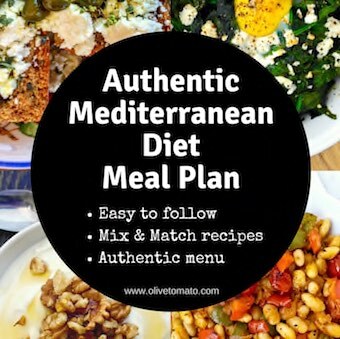 For a balanced meal, ideally you want the meat to make up ¼ of the meal, ¼ the starch and the rest salad or other vegetables. You may also serve this as an appetizer, if you do, I like shaping them in smaller bite-size shapes. This also freezes well (without the rice). 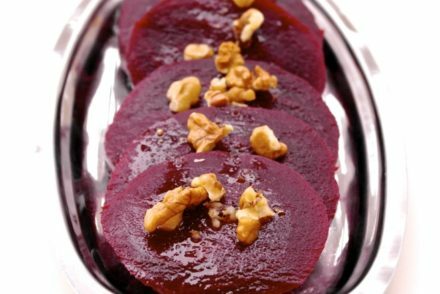 The beauty of this recipe, is that it looks difficult to make but in fact it is very straightforward and the result is a beautiful and delicious dish. 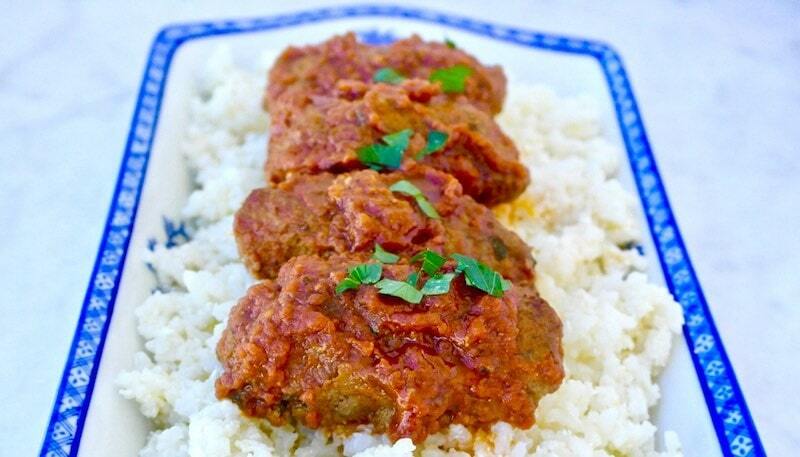 Greek Baked Meatballs, with spices, drenched in thick tomato sauce. * I sprinkled some fresh chopped parsley from my balcony for color. For the meat balls, mix all the ingredients, kneading them for a few minutes. Place the mixture in the refrigerator and let it sit for at least 20 minutes. Preheat the oven at about 350 degrees Fahrenheit ( 175 Celsius). Start making the sauce, mix in a bowl the tomatoes, olive oil, paste, salt, pepper, sugar and process in a food processor until smooth. Put in a small pan and add about 2 cups water, mix well, let it come to a boil and then lower the heat and simmer for about 10 minutes. Take out the beef mixture and shape into cylindrical shapes. Make about 20. Take a large enough casserole dish that can fit all the meatballs in one layer. Start by pouring the sauce in the casserole dish, spreading it. Than you place the meatballs on the sauce (raw) in one layer. Drizzle some olive oil on top of them and bake them until they lightly brown for about 45 minutes. Than turn on the other side so that they brown on that side as well for about 10 minutes. (If the sauce starts drying out, add 1/4 cup hot water at a time in the pan). Remove and serve with rice or mashed potatoes or another type of starch. Hi Janice, I used lean (not extra lean). Chuck is what I used. Thanks Elena, I’m looking forward to trying these. 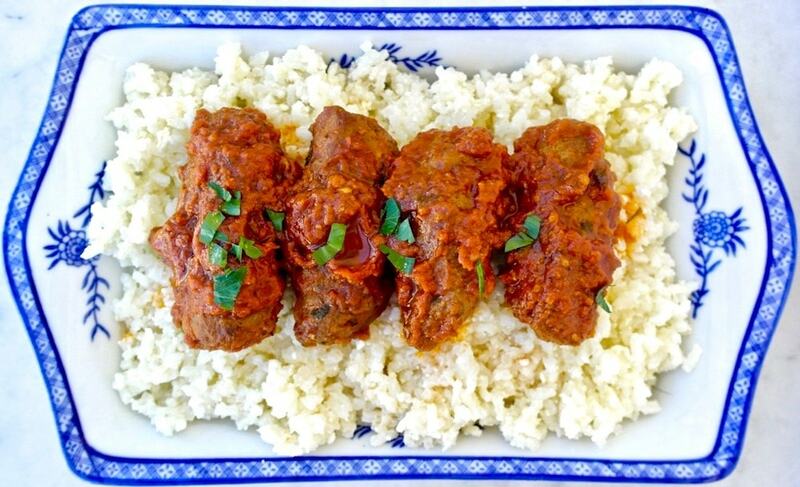 Elena – have you ever made this dish using turkey for the meatballs? No, but that’s a great idea! 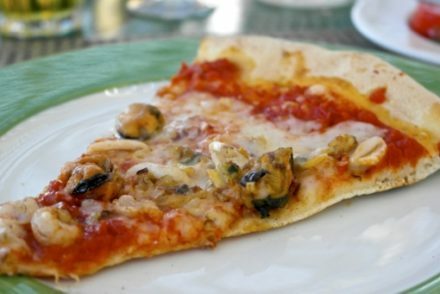 Elena – any chance we could get the nutritional content of this dish and others for those of us counting calories? A lone teaspoon of cumin doesn’t sound especially spicy. What else could one add without spoiling the character of the dish? You would be surprised with how far a teaspoon of ground cumin (not seeds) can go, it is pretty strong even though it seems like a small amount, along with garlic it is quite rich and spiced (not spicy as in hot). The original recipe for this dish is 1 teaspoon of ground cumin per 1 pound of meat as noted above, you could add a stick of cinnamon to the sauce for more spice (although the authentic recipe does not include cinnamon) and maybe a few allspice and clove. Planning to try these this weekend, and I am expecting pure delight if this recipe even comes close to some others I have tried and now love. 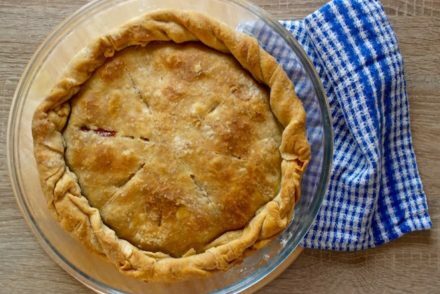 One question: do you use red wine vinegar, same as your wonderful kefthedakia recipe? Yes, I used red wine vinegar. Have a good weekend! Thank you, Elena. Wishing you and your family the very same! Thanks for sharing Patti. Yes, the sauce is meant to be a lot, in many cases the meatballs are covered to the point where you can’t see them. I like soaking the sauce with some good bread. These meatballs are really good. My family loves them! I have made them many times and am in the process of making them for an appetizer. The cumin is perfect. These meatballs taste like gyro meat, so I suspect that cumin is a big ingredient for gyro. I haven’t tried using other meats, because these turned out so well with a lean ground beef (7%). I may tray a combo of turkey and beef. I would highly recommend these. Thank you Elena for this yummy meal. Thanks Bonnie! I think it would work nicely with turkey too. That is fine, you can use the same amounts.